I've created a new blog for my other artistic passion, visual art. It is a work in progress, however, it has begun and feels like a good time to announce it. Click this link to jump over to it. 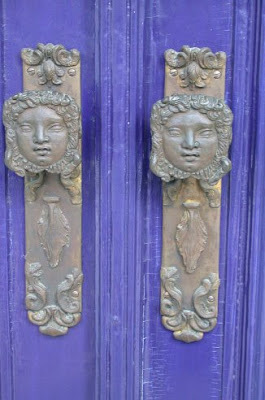 The image above is the door handles at the Fuchs Villa in Vienna. Greg and I traveled to a tiny village in the Austrian Alps called Reichenau during the summer of 2003 for a Visionary Art workshop. We will never forget it. The door handles, as well as most of the items contained in the Villa, were designed by Maestro Ernst Fuchs, the father of Fantastic Realism. Our professor, Philip Rubinov Jacobson, has once a year workshops in Austria and other foreign lands like Italy titled Old Masters, New Visions.